Leaders from regional organizations throughout King Countygathered at Seattle Children's Museum today to announce reduced-price and free family access programs that they plan to offer if voters pass Access for All - King County Proposition 1. Prop. 1, which will appear on the August 1 primary ballot, will improve equity in access to arts, science and heritage in our communities. Among other benefits, it will create new free or low-cost memberships and tickets for low-income and middle-class families who face financial barriers to providing their children with access to enriching learning experiences at our regional arts, science and heritage institutions. "Currently, we give away nearly 80,000 passes each year to community partners and those in need, but we could provide even more," said Woodland Park Zoo President and CEO Alejandro Grajal. "Proposition 1 will help us double our reach to new schools and new community organizations and, open our doors to more families across King County." Speakers included Alejandro Grajal, President and CEO, Woodland Park Zoo; Makaela Lambert, Youth Intern, Woodland Park Zoo; Laura Reynolds, Director of Education & Community Engagement, Seattle Symphony; Jim Wharton, Education Director, Seattle Aquarium; Keni Sturgeon, Vice President of Science Engagement and Outreach, Pacific Science Center; Doug King, CEO, Museum of Flight; and Jack Sorensen, Campaign Manager, Access for All: YES on Prop. 1. Organizations highlighted several existing programs that have found success in giving families more access to arts, science and heritage experiences but would be greatly expanded with the passage of Prop. 1, as well as detailed new programs they will be able to create if the measure passes. "Prop. 1 will provide funding that will allow the Pacific Science Center to expand our Family and Youth Access Memberships to even more residents in King County who can't afford memberships on their own," said Pacific Science Center Vice President of Science Engagement and Outreach Keni Sturgeon. "We will be able to ignite curiosity and fuel a passion in discovery, critical thinking, and experimentation to underserved communities all over our county." "Passport 2 Play is a program for individual families, groups and social service providers can apply to participate. Currently, the Seattle Children's Museum currently serves over 30,000 visitors, and over 1,000 preschool and school-age groups through its Passport 2 Play free and reduced admission program," said Seattle Children's Museum Director of Education and Volunteers Amy Hale. "Passing Proposition 1 will expand Passport 2 Play's reach, and help level the playing field for families that otherwise couldn't afford the experience." 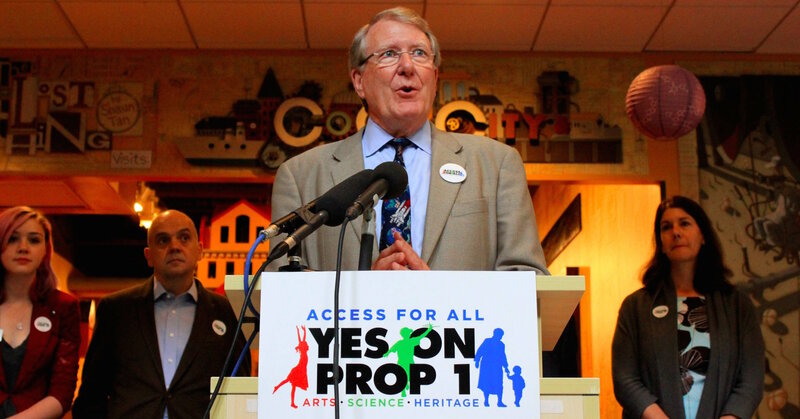 "Too often a school's zip code or a family's income determines whether a child has access to arts, science and heritage learning, despite the fact that we know these hands-on opportunities greatly improve a child's overall educational success," said Jack Sorensen, campaign manager for Access for All - Yes on Prop. 1. "Proposition 1 will change that, ensuring all kids and families have equal access to arts, science and heritage education." In addition to funding expanded and new low-cost family access programs, Proposition 1 will fund in-class programs and free field trips for every public school student in King County. Prop. 1 has been endorsed by The Stranger, Seattle Weekly, the King County NAACP, El Centro de la Raza, FareStart, the King County Democrats, Bill Nye the Science Guy and hundreds of other advocacy groups, individuals and arts, science and heritage organizations throughout the county. You can find an expanding list of endorsements online at accessforallwa.org/endorsements.